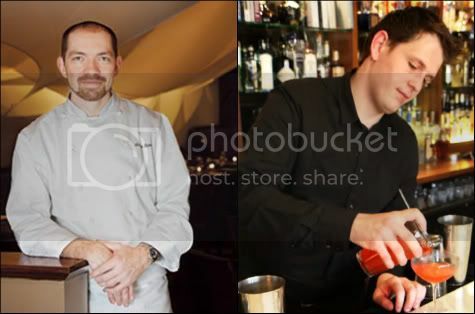 Giuseppe Tentori of GT Fish & Oyster and Sepia's Josh Pearson. It was a big night Friday for Chicago's restaurant community as the annual Grand Chefs Gala took place at the Fairmont Hotel. Benefiting the Cystic Fibrosis Foundation, the event attracted many of the city's heaviest hitters for the prestigious Banchet Awards, which rewards top talent on the local dining scene. In addition to the awards ceremony, restaurateurs Jimmy Bannos and Scott Harris were presented with the Founders Award. That achievement honors those who have significantly affected lives in a charitable or humanitarian way. Bannos and Harris also own The Purple Pig, which took home the Peoples' Choice award.